I made this quilt for a charity project that the KCMQG has been working on over the last few months. We are making baby quilts that will be given to NICU babies (to be taken home and kept) at a local hospital. I made the quilt top and did the binding on this quilt, and it was quilted by the wonderfully talented Angela Walters, who blogs at Quilting is my Therapy and does lots of amazing things with her quilting. 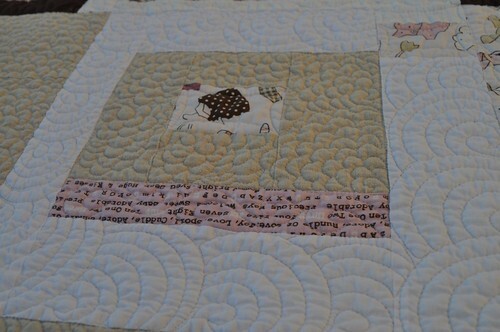 Here are some close-ups of Angela's quilting. It is so beautiful! I need to find out what kind of batting she used because I really like how it fluffed up after being washed. Apparently some of the Modern Quilt Guild leaders have some kind of friendly competition going on and I'd like stick my nose in and invite and encourage challenge the other Modern Quilt Guild folks to find a need in their communities and make quilts for a local charitable cause. Let's use our talents, our love of fabric and quilting, to bring some love and comfort to others in need! Now if you don't already know about this, please visit Amy's Creative Side because she's hosting her 4th Blogger's Quilt Festival this week! It's a great opportunity to see amazing quilts and meet new quilting and blogging friends. Thanks so much to Amy for all your hard work putting this together! You did an awesome job of making those blocks! The quilt is fabulous! 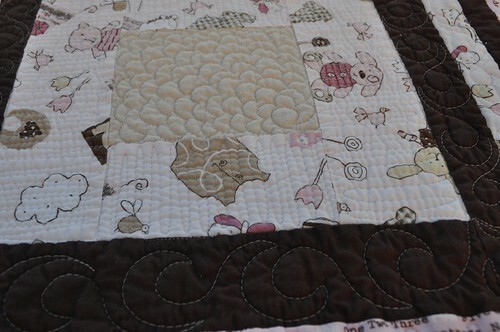 the piecing and especially the quilting is adorable, great job!! What a wonderful way for you to share your gift with others :) Beautiful work! Vicki! This is a WONDERFUL quilt...I love the monochromaticity of it! You did a great job of balancing it, with evevery block being unique! Bravo! I actually think that 5 fabrics is a "decent" number for this type of quilt. And I have to say I really like these simple, boxy designs that your generation of quilters has brought to the table. The "wonkiness" works. I think this quilt is really pleasing to the eye. Gorgeous fabrics. Love the color combination. A great project to share your talents with others. this is a gorgeous quilt...such soft colors. the quilting is just amazing. What a pretty quilt! I love the colors and the quilting is amazing. I love that it is going to such a great cause. Nice work. oh my goodness gracious~fabulous. the color scheme is perfect. Love this quilt and the quilting is amazing! Wonderful quilt - and I do understand somebody hesitating if you could only use 5 fabrics ;-)) The more the merrier! But your quilt is a great example of "it can be done" - and it looks perfect! 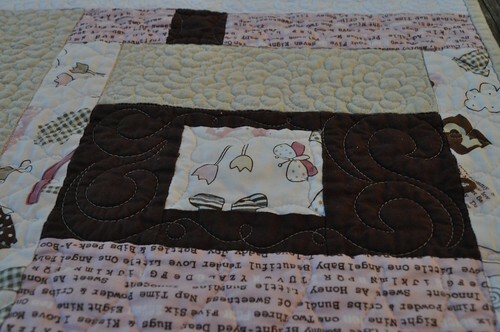 This is too beautiful - I love the airy, modern feel of it, and the quilting is just amazing! Excellent quilt! I just joined the Philly MQG -- the modern style of quilting is very neat! That is great that you have so many quilts for local charities. This style of quilting is very fun! Love the improvised blocks! The five fabrics work well together. Great that your guild is making charity quilts. Thanks for sharing! What a wonderful quilt! 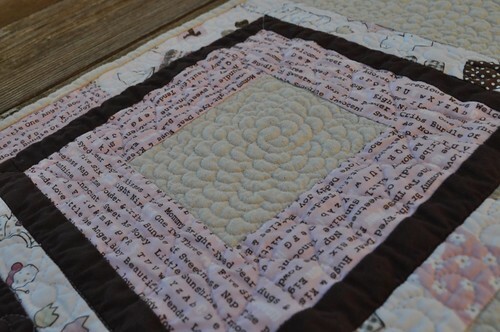 I love the soft palette and the gorgeous quilting adds beautiful (and snuggly) texture. Thanks so much for sharing! What a neat quilt - such unusual colours - love it! What a wonderful quilt. I love the colours. I was surprised that theres only 5 fabrics, You've created so much interest with your blocks and placements that it looks like more. The quilting is stunning. 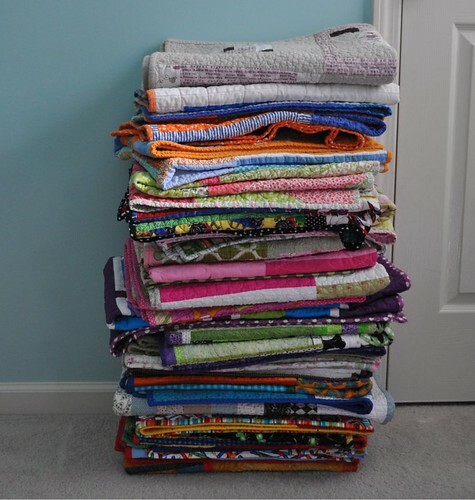 What a great photo of all those quilts that are going to good homes, you'll make a lot of people very happy! Your quilt has turned out really well. Great use of design with the colours you had. Love Angela's quilting, too. What a wonderful gift for the hospital. What a beautiful quilt! Thank you for donating such beautiful quilts. I have been in hospitals with my babies and I'm so grateful for those who donate blankets and other comforting things. It really makes a difference for the families there in those stressful times. I've been wanting to make some to donate also to our hospital to give back. Thanks for inspiring us all! Such a wonderful thing to donate such a wonderful quilt - I know how amazing a NICU is (my twins were prem) and it is such a wonderful thing to support them. Such an adorable quilt- I love the color combos. I love this quilt! So sophisticated in those neutrals! Interesting colors. Makes a very striking quilt for a very good cause. I LOVE these fabrics!! They are so perfect for this project! it is an awesome quilt. I love the quilting, it must have taken you a long time to quilt is so beautifully. great work! 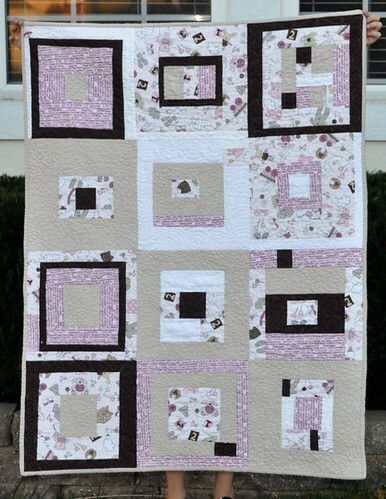 What a sweet simply charming quilt-great use of limited fabrics. Understand your concern, I've made 20" quilts with more that a hundred different fabrics but you rose to the challenge. Such a generous gift. Thanks for visiting and commenting on both my blogs. The limited palette and fabrics works so well, hard to do but it concentrates the effect.